TODAY, showcasing art is about ambience, concepts and event management. 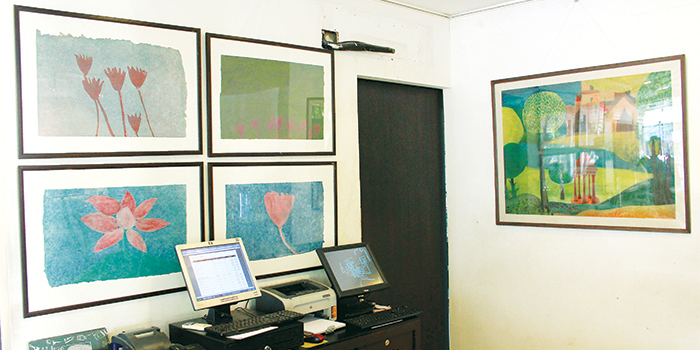 Apparao Galleries has caught up with the trend and plans to innovate further, with poets and artists thrown into the mix. Sharan Apparao, owner of Apparao Galleries, explains how they are targeting a more specific audience by putting up their latest collection, Playing Fields/In Search of Escape, in Sandya��s, a popular hangout in Nungam-bakkam. Apparao admits, a�?This is the first time we are collaborating with a restaurant. I have worked with hotels before. We will be putting up paintings of artists on the walls of Sandya��s and we will change them every month.a�? Clearly aiming at the hip and young, sheA� says, a�?I want to make art more exciting for youngsters.a�? As part of the show, paintings by artists like George K, P R Satish, Parul Pattani, S Natraj, Priyanka Govil, Dashan, Agathe Patil and A Z Ranjit will be exhibited at Sandya��s. a�?I want to break barriers and make art more accessible to people. Though many do not understand modern or contemporary art, I want to make it available for them,a�? Apparao adds. Keeping in step with the raasika and artist interactions of the musical season, Apparao has another event planneda��Creativity and Coffeea��with contemporary dancer Tishani Doshi and chartered accountant-turned-poet George K. a�?We always want to know what goes into an artista��s creation and here, Tishani and George will talk about their art work, how they explore creativity and what art means to them,a�? Apparao says. Meanwhile, Sandesh Reddy, owner of Sandya��s, believes food and art meld together beautifully. a�?Making food in itself is an art. By having art on our walls, we are creating awareness and establishing a connection between art and food.a�? Some of the paintings will be at the Nungambakkam outlet, while the rest will be at Cenatoph Road.